Shake all ingredients except sparkling wine over ice until the outside tin is frosted over. Strain into a well chilled, sugar-rimmed cocktail glass, leaving room for the sparkling. Top with sparkling wine. 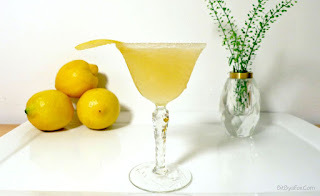 Add a lemon twist. Cook the cheese tortellini according to package directions. Remove from the stove top, drain and rinse with cool water. Set aside. 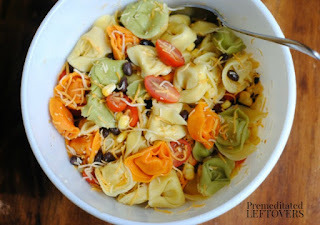 Combine the cooked tortellini, black beans, corn, tomatoes and shredded cheese. Gently stir the mixture to combine the ingredients. In a small bowl, combine the ranch dressing, salsa, and cumin. Add the southwest ranch dressing to taste, about ½ cup at a time. Stir to combine. Cover the extra dressing and store in the fridge. Place the salad in the fridge if not eating right away. In a small food processor, add in pretzels, and pulse until very fine crumbs form. Set aside. Preheat oven to 350°F. Spray 13x9-inch baking pan with cooking spray; set aside. Combine crushed pretzels and granulated sugar in medium bowl. Add butter, and mix until blended. Firmly press mixture into baking pan. Bake 8 minutes. Set aside to cool. Meanwhile, stir together brownie mix according to package directions, using vegetable oil, egg and water. Carefully spread brownie batter over hot pretzel crust. Combine Peter Pan Simply Ground peanut butter and confectioners' sugar in small microwave-safe bowl; microwave on HIGH 30 seconds or until melted. 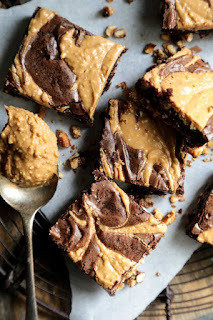 Top brownie batter with spoonfuls of peanut butter mixture. Using a knife, swirl peanut butter mixture through brownie batter until it is marbled in appearance. Bake 23 to 28 minutes or until wooden pick inserted near center comes out clean. Cool completely. Cut into 16 large squares.